Green and gold frogs that is, and who continue to call the sunken bath tub beside the little garden potting shed, home. 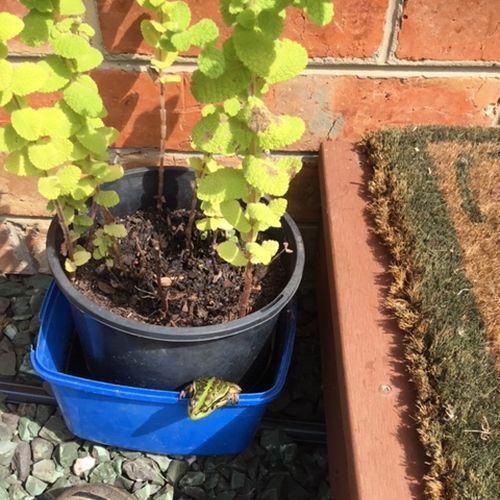 Actually our whole back garden seems to be something of a frog nursery, and although the green and golds rule, we’ve also spotted tiny tree frogs amongst the raspberries and grape vine, and for a few days at least one banjo frog was bunking down with his green and gold cousins. Unless there are way more frogs on the property than are living in the bath tub though, some of the green and golds are getting adventurous and ranging further afield. On more than one occasion I’ve surprised them while picking strawberries or raspberries, while in the last couple of days we’ve noticed one who clearly prefers his own company. He or she has taken up residence in a regularly-watered plant pot by the back door. Given the record-breaking temperatures that have characterised January this year, and with more hot weather forecast, frogs must be having a hard time keeping cool. The long dry spell means several smaller dams are also probably drying up, so reliable waterholes like our bath tub must represent premium real estate for frogs. They aren’t stupid. They know the garden areas that are watered regularly, and which plants are the best ones to seek shelter so it’s no surprise the bath tub has become a cool and welcome sanctuary. And now we know it has so many amphibian residents we naturally make sure it’s topped up every day. With so much of Tasmania currently on fire, and so many of our wildlife displaced and suffering as a result, it’s lovely to think our garden is an oasis for at least one species, and a few individuals who’ve chosen to stick around longer than we remember them ever doing before. While some still dive into the tub when we walk past, others have become increasingly unconcerned by our presence and just continue to bask contentedly in the sunshine.